London is often depicted as chilly, foggy and rainy. Londoners are weather obsessed so they do talk about it a lot. But locals also say not to worry, it really doesn't rain that much in London. The beauty of a city with so many things to do means that there are loads of attractions on hand for when the rain does start to fall or the fog lingers. London is home to many museums, theaters, shopping opportunities and, keep in mind the Thames river boats are covered. So let it rain on your vacation to London—you'll have a wonderful time. This is probably the most obvious idea but still worth mentioning as London has so many great museums and galleries. The larger ones are all free so you can pop in for five minutes when you are in the area if there is a sudden downpour. Must-see museums include the British Museum. The museum houses interesting and rare collections from Egyptian mummies and pieces of the Parthenon to the game-changing Rosetta Stone and an enormous Easter Island figure. Located in London's West End, covering 18.5 acres, the British Museum is not just one of London’s best museums, but one of the world’s. Military History buffs should visit the Imperial War Museums which are actually five museums and sites which serve to preserve the history of British conflicts starting from WWI to the present day. One of the collection’s most fascinating places to visit is the Churchill War Rooms, a subterranean bunker and network of rooms under the streets of Westminster. You can also visit the Royal Navy ship HMS Belfast permanently moored in the River Thames. The displays bring military history to life. Puzzle your way out of this one. Open from 10 a.m. to late into the evening, an escape room is an excellent indoor option, although you do need to book ahead. It's a live escape game for teams of 3 to 5 people and you'll select a scenario (and a level of difficulty). You get shut in a room and have 60 minutes to work out how to open the locks and find a way out. The game is suitable for 9 to 90-year-olds and is a lot of fun. "ClueQuest - The Live Escape Game" is located at 169-171 Caledonian Road, London, N1 0SL. Who doesn't love watching a movie when it's raining outside? Leicester Square is the heart of London's cinema-land and the location of most London film premieres. As well as the big cinemas you'll also find the Prince Charles Cinema here which specializes in lower rate tickets. There is also an IMAX cinema at Waterloo and another inside the Science Museum. If you're own, head to BFI Southbank to the Mediatheque which is a space where you can watch the British Film Institute's archive for free. London theatre is perfect for taking your mind off the inclement weather. Find out how to get cheap London theatre tickets. Theaters in London range from those that attract Broadway names in central London's West End (with 40 theaters) to Pub theaters which consist of casual productions housed in separate rooms of pubs. The performing arts don't stop with theater productions. Year round, the historic Royal Opera House in Covent Garden hosts The Royal Opera and The Royal Ballet, and The London Coliseum in the West End hosts the English National Ballet. As long as it's not too windy, a rainy day can be a perfect time to take a cruise along The Thames. You can get a dining cruise from Bateaux London (try their dinner and afternoon tea cruises) or on the Silver Sturgeon. Both offer daytime and evening options. With Bateaux London, you'll set sail from just outside Embankment station and enjoy a relaxing three-course meal as you drift past iconic London sights like the London Eye, Tower Bridge, and the Houses of Parliament. They even offer jazz cruises on the Sunday dinner sailing. London does have some of the best shopping in the world. If you want to stay in one location, consider a large department store such as Harrods or even one of the two Westfield shopping malls (Westfield London or Westfield Stratford City). Oxford Street is long (this one street has four tube stations) and is lined with High Street shops and many flagship branches. Turn off at Oxford Circus to explore Carnaby Street or take the kids to Hamleys as there are seven floors of toys. This rotating attraction is definitely a good move on a rainy day as you can enjoy the views from a warm, dry capsule. Rain or shine, the London Eye is one of London's best-loved attractions and carries around 10,000 visitors every day in its 32 capsules. Yes, there will be raindrops on the windows but use those to take more interesting photos of the sights in the rain on the London Eye. Comfort eating can be what's needed when it's raining, so go for fish and chips or some other British cuisine. Whatever the weather, every day is just right for afternoon tea with fancy cakes and a dainty cuppa. If you're looking for something more casual, have a pint of real ale and a decent pub pie. To make the most of a rainy bus journey, head upstairs and grab the seats at the front which never ceases to bring child-like joy to all who get that position. Some good routes for just watching the world go by including the no.11 plus the no.9 and no.15 which are heritage routes on old Routemaster buses. At Bounce London, play table tennis at the location where ping pong was created and patented in 1901. You can book by the table so this is a good option for large groups to have some fun indoors together. The streets will certainly be less crowded and this would be grand fun for visitors who come from hot countries where they can't get out and walk comfortably. The shopping areas are fun to walk since you can duck into a store or tea shop if you are getting to damp. Walking tours take place even on rainy days. There are many options and some feature stops indoors. 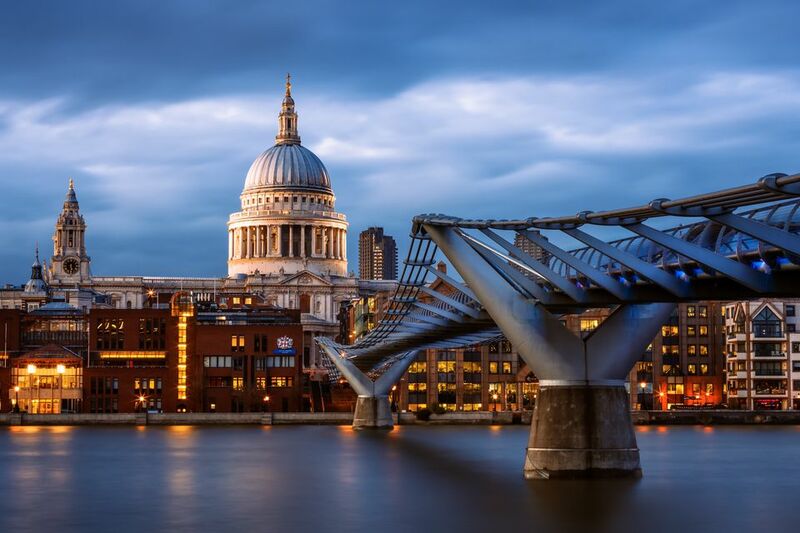 Consider a museum-focused tour, a food tour, or a City of London Walking Tour, focusing on the old Roman settlement, St. Paul’s Cathedral, and the Tower of London. If you are not afraid of getting wet then head out and enjoy the rain. Umbrellas are on sale all year round in London so wear a raincoat and a grab a brolly if you want some protection. The Warner Brothers Harry Potter Studio Tour offers you a chance to delve into the world of Harry Potter by exploring two sound stages and a back lot with original sets, moving creatures, and amazing special effects. There are interactive activities along the way. You can see the original Hogwarts Express steam engine and step onto Platform 9¾. Throughout your time, you'll discover how the special effects in the film were made and, at the end, do a little wand-shopping or quaff a Butterbeer. There is a Studio Café, Starbucks, and a Backlot Café situated about halfway through the Studio Tour. Tickets must be purchased in advance and are available online. While the Tower of London has extensive grounds, there is much to see indoors. Consider taking a Yeoman Warder's tour or Beefeater's tour and opt to visit the Crown Jewels, too. The hour-long tours by the Tower's special guards are usually offered every half-hour. Your guide will give short talks about the history of the Tower of London, tell a few spine-tingling stories, and take you through some of the buildings. Consider the Soho Legends and Pub Tour for a walk through history with a small group. Have a pint or two and wander trendy SoHo with your guide and experience the area where many famous musicians and celebrities lived and worked. The tour starts in Picadilly Circus and stops at several colorful pubs along the route. Guides will dish about pop culture icons such as Marilyn Monroe, Jimmy Hendrix, Keith Moon and Paul McCartney who frequented the area. Victorian covered markets are worth seeing for both their architecture and for what's for sale inside. Greenwich Market is a great example along with Leadenhall Market and Covent Garden Market. If you are hungry or are shopping to put together a meal, head for Borough Market, one of London's oldest food markets. There are vendors selling hot foods, restaurants where you can sit down and enjoy an informal meal, and stalls with produce and international delicacies like chocolates and cheeses. At the Barbican Conservatory, you can enjoy birds such as finches and quails and see ponds of exotic fish while you stroll through the gardens with 2,000 species of tropical plants and trees, all under a glass roof. You can partake of afternoon tea during your visit, with a selection of handmade cakes and savories inspired by plants grown in the Conservatory. Reservations can be made online. The Conservatory is open on selected Sundays each month and Bank Holidays from 12 noon–5 p.m. Admission is free. London's theaters have an international reputation and most likely you'll be taking in a performance or two. But learning about the workings of a production is a great way to gain insight into how these performances are designed and put together. You'll learn about the fascinating history of these famous buildings and about the actors who have performed on their stages. The National Theatre, Royal Albert Hall and Shakespeare's Globe Theater have backstage tours available most days. Big Bus London provides several routes where you can take refuge on the bus as it rains and hop off between showers at one of their 45 designated stops. There are three different routes available. You can hop on and off as much as you want within your ticket validity. They take you to London’s best attractions or you can sit back and stay on the bus and enjoy the trip from inside. London is known for its bakeries. International offerings range from Japanese sweets to French pastries reflecting London's diversity in its population. Something warm out of the oven has a special attraction on a rainy day. An innovative sandwich from the Dusty Knuckle, such as one with porchetta and salsa verde or spiced cauliflower and tahini is an enjoyable alternative to the average fare. And the markets are ideal for pastry and bread-hunting. Bread, at Borough Market, is known for doughnuts and also serves up excellent cheese and olive sticks. They also teach baking. Last but not least, partake of an iconic British pass time, afternoon tea. Sit back and experience this British tradition in an iconic setting. Tea at the Ritz Palm Court is a top London experience. Men must wear a jacket and tie for tea at the Ritz. You'll be served fine sandwiches, scones with Cornish clotted cream and strawberry preserve, and unending delicate pastries and cakes. Although there are 18 different types of loose-leaf tea to choose from, you can also sip a glass of Champagne during the experience.